Since we’re going to have a spring blizzard I thought I’d go ahead and post this soup! My daughter loves pesto and pasta so on a recent visit to her house I arrived with a package of Trader Joe’s pesto tortillini and made this soup. You know you have a winner when the 20 month-old twins, the three year old, and all the adults enjoyed it! We served it with garlic bread and tossed salad and had a wonderful meal. 1. 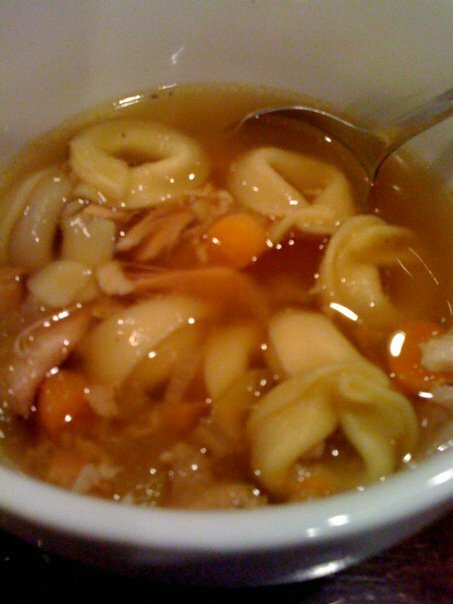 Place all the ingredients EXCEPT the tortellini in a soup pot and bring to a boil. Reduce heat to low and simmer for 1 hour. 2. Remove the thighs and shred into bite-sized pieces and return to pot. 3. Meanwhile, cook the tortellini according to package instructions and drain. Add to soup pot, stir, and ladle into bowls. Garnish with grated parmesan cheese.